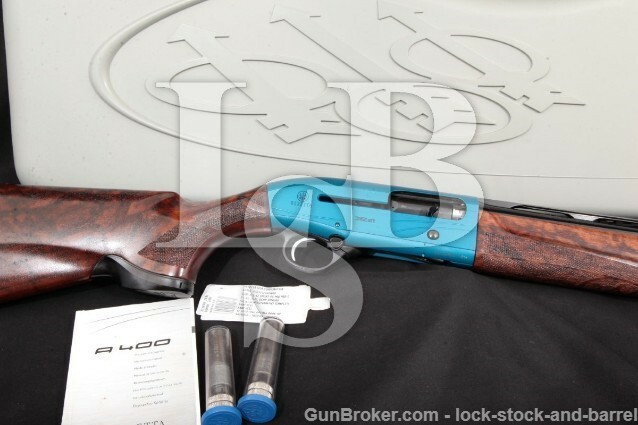 You are here > Home / Sold Fine European Arms, Sold Modern & Tactical Arms / Beretta A400 Xcel Sporting Gun Pod J40CM10, Blue 30″ Semi-Auto Shotgun, Case & Chokes, 2014 12 GA.
Markings: The left of the barrel is marked “SPORTING / BERETTA – GARDONE V.T. – MADE IN ITALY / OB HP 12 Ga. 76mm for 2 3/4″, 3″ – 30″ – 18.6”, the right is marked with Beretta’s two-line warning. The left of the receiver is marked “A400- Xcel -12 GA / MADE IN ITALY – PATENTED”, the right is marked with a Beretta logo, “Xcel” and at the bottom-front with the serial number and “IT14”. The bottom of the receiver at the front is marked with two Italian proofs and the date code. Choke: The barrel is threaded for removeable chokes. Installed is Modified, Improved Modified and Improved Cylinder are included. Sights / Optics: There is a white bead in a base at the front of the rib and a smaller silver-colored mid-bead. The top of the rib is finely checkered and the top of the receiver is serrated for glare reduction. Weight: 7 lb., 10.2 oz. Stock Configuration & Condition: The stocks are a two piece checkered walnut set. The grip cap is removable to allow installation of a Beretta Grip Pod and the recoil pad has a hydraulic shock absorber. The stocks have no notable wear or damage, only light handling marks. The checkering is sharp. There are no chips or cracks. The buttpad has no notable wear or damage, in Excellent condition. The LOP measures 14” from the front of the trigger to the back of the recoil pad. The stocks rate in Excellent overall condition. Overall Condition: This shotgun retains about 99% of its metal finish. There is no notable wear or damage, only light handling marks. The pin heads are unmarred. The markings are clear. Overall, this shotgun rates in Excellent condition. Box, Paperwork & Accessories: This shotgun comes in a gray plastic Beretta case with manual and the two extra chokes. The case has scattered light storage wear, in about Fine-plus condition. Our Assessment: From Beretta’s website: “The A400 Xcel is a 12-gauge competition shotgun that is faster-cycling, softer-shooting and better balanced than anything else on the market. Built on the revolutionary A400 action, it delivers follow-up shots 36% faster than any other brand, while its advanced recoil-reducing systems make it absolutely pleasant to shoot, even on demanding all-day competitions. Its sleek lines and superior ergonomics are designed with one goal in mind: letting the A400 naturally follow your eye to the target. This is why it has quickly become a favorite among serious competitive shooters the world over.” We couldn’t say it better ourselves! This A400 is in Excellent condition, showing little to no sign of use. It is the Grip Pod model, allowing for installation of a Bluetooth compatible unit which is able to track round count, walking distance and store photos for all your hunts. The gun comes with a nice Beretta case for storage and transport and an assortment of three chokes for all your hunting and sporting needs. Please see our photos and good luck! 30″ Semi-Auto Shotgun, Case & Chokes, 2014 12 GA.